LowBoard 22 is a 22mm thick chipboard tongued and grooved moisture resistant underfloor heating panel that is floated or mechanically fixed over a flat and even timber or solid sub floor. When using tiles as the floor finish, it is recommended that the LowBoard is mechanically fixed down, you will also need to refer to the Tilers recommendations. The low panel height makes it suitable where there is not enough floor-to-ceiling height to install a conventional underfloor heating system. The panel has a multi-directional design for ease of installation. The universal panel is simply laid across the floor with no loop ends and straights to configure. The pipe pierces the foil diffuser as it is pressed into the channels before a finished floor deck, 6mm flooring grade ply , MDF or similar is mechanically fixed over the LowBoard panels to complete the floor. OMNIE LowBoard system using 12mm PE-RT pipe to DIN 4726. The 22mm LowBoard panels to be laid fully floating with all tongue and grooves fully glued to form a continuous layer over a flat & even sub-floor. Next a minimum of 6mm covering layer such as flooring grade ply is then mechanically fixed over the LowBoard panels, If timber or laminate is used there is no need for a covering layer on top of LowBoard. For Tile & Decorative floor finishes The LowBoard Panels will require bonding to screed or a deflection free timber floor with all tongue and grooves fully glued with a minimum 6mm flooring grade ply or tile backerboard mechanically fixed over, Please refer to the Tilemaster Adhesives Ltd specification guide (IG UFH 23, see link below) or obtain specific conformation and guidance from floor finish installer or manufacturer/supplier. The system is to be designed, installed and commissioned to BS1264. LAYFAST – Speed up installation time. This product uses our multi-directional pipe channel system. 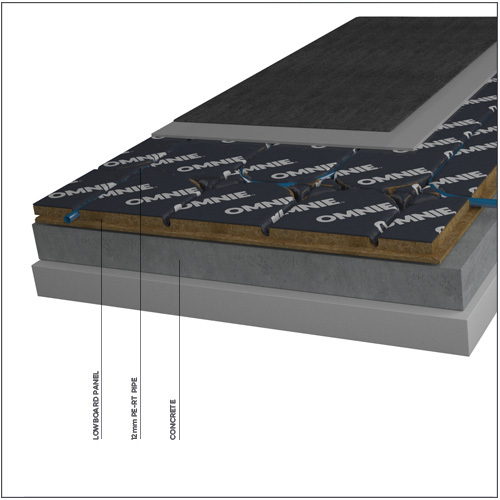 DRYSYSTEM – No wet trades required, designed for dry constructions. TILEOVER – Can be tiled over using our unique Tileover technology. Existing slab/floor deck to meet at least SR2 (5mm deviation in 2m) requirements for floor regularity (BS8204) and preferably SR1 (3mm deviation in 2m). The floor finish company may have their own requirements which take precedence. Heat outputs are dependent on the water temperature, floor construction, system dimensioning, floor finish & design conditions. Please call 01392 36 36 05 to discuss your specific requirements. Heat outputs below are based on 12mm PE-RT pipe at 150mm centres with 6mm ply laid under carpet and 12mm ply under tiles. Air Temperature = 20°C. (0.15 m²K/W = 1.5 TOG).